“Take My Nose Please,” a history of comedians and plastic surgery, is funny and poignant by turns. It won the audience award at the Miami Film Festival and the Berkshire International Film Festival. Distributed by The Orchard, it is widely available, beginning tomorrow, January 9th, Joan’s actual Birthday, On Digital and On Demand—including on ITunes Prominent Movies, Amazon Featured Movies to Rent and Buy, and FandangoNow New Releases. It is also available on most Cable and Satellite TV platforms, including Comcast, Cox, Verizon, Charter, RCN, Time-Warner Cable and Dish, to name just a few. 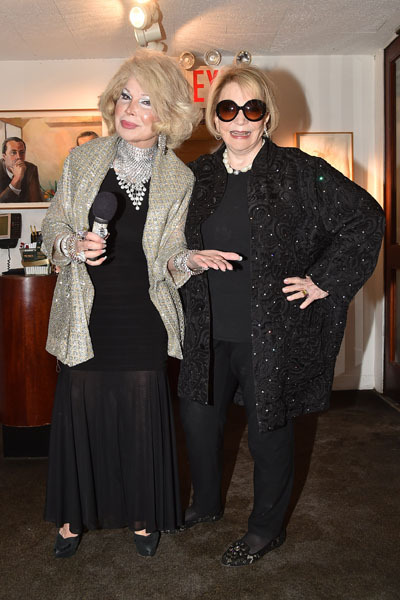 Guests at the bash included MoMA curator Paola Antonelli, Sheila Nevins, Judy Bachrach, Bina & Walter Bernard , Louise & George Beylerian, Mario Buatta , Gina Chiu, Judy & Jerry Della Femina, Jamie De Roy, Dr. Roy Geronemus , Cathy Hardwick, Tracy Jackson + Glenn Horowitz, Janet Kardon, Fern Mallis, Grant McCracken, Sheila Nevins, Virginia Postrel, Susan Roy, Suzanne Slesin and Michael Steinberg , and Shirley Young –plus Joan’s children, grandchildren and one great-grandchild. Joan Kron is already working on her next film.